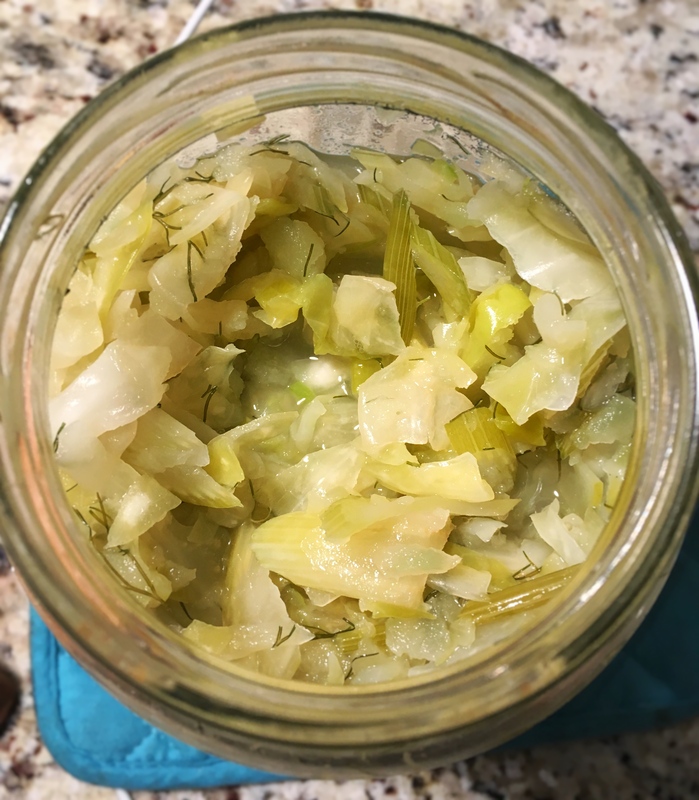 This recipe uses cabbage, fennel, celery, and green apple, but but other vegetable varieties can be substituted as long as the water and sea salt in the recipe is kept constant. Try cabbage, scallion, and carrot with grated garlic for a flavorful combination. Choose organic vegetables only. Organic vegetables are free of chemical herbicides and pesticides, they are grown in more biodiverse soil ensuring a bioactive soil full of vitamin and minerals that contribute to a healthier, tastier, and more nutrient dense plant. This will also ensure a consistent ferment. Herbicide and pesticide residue can disrupt the natural fermentation process. Slice all vegetables thinly using a knife or mandolin. (Pictured above). Toss into a large bowl that is wide enough for both of your hands to be in and move around comfortably. Sprinkle with sea salt and let stand for 10 minutes. Just by allowing the sea salt to sit on and work on the vegetables, their cell walls begin to breakdown and become more pliable. Splash some white vinegar on your hands and rub together to clean them removing any lotion or soap residue which can affect the ferment. With both hands, massage vegetables. This can be accomplished by grabbing handfuls and squeezing, rubbing vegetables between your palms, or pressing down on the vegetables and kneading them like bread dough. Keep massaging until water begins to release and the vegetables become very pliable. 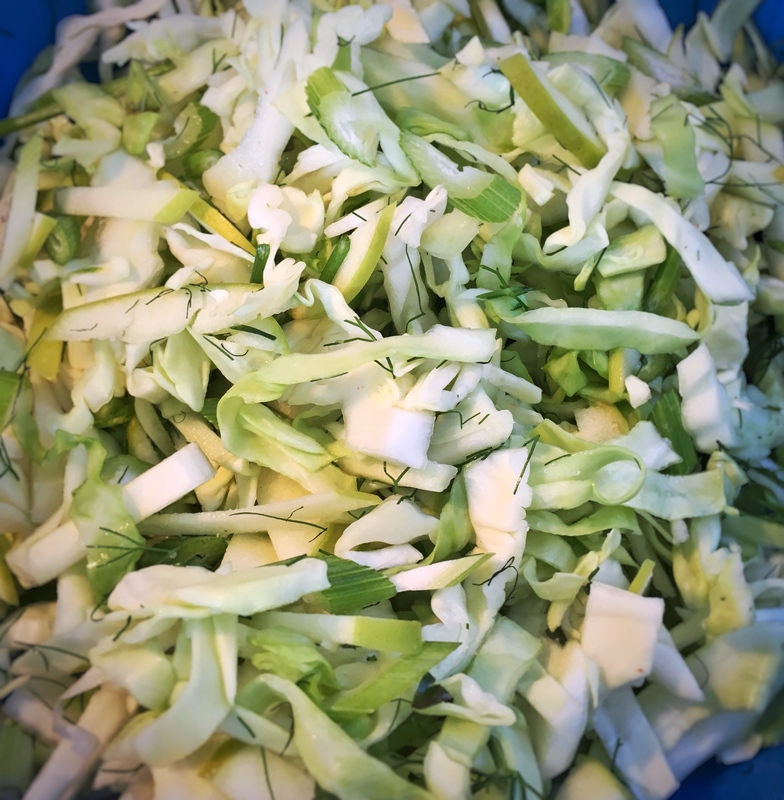 The apple will likely mush up, the cabbage, fennel, and celery will stay intact, but will become softer and pliable.